2 new contacts added to contacts. Dynamic animation of The Function of TRAFOSEAL II was added. SINDRET Tool updated to a new version. FAQ section updated with general solutions of 7 most common problems. Within the Altmann Group and its affiliated partners, we accumulate several decades of technical and management expertise from the Energy, Transformer and Consulting Environment. 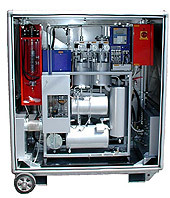 We are focused on the key issues of On-Line Maintenance of Oil-Cellulose System of Power Transformers above all on its on-power dewatering & degassing, the transformer online and offline oil regeneration and purification, so that the transformers of our customers can operate with secured and safe conditions and the shareholders can benefit from considerably reduced costs and risks. You are welcome to visit us any time and we will be delighted to motivate You to share your ideas with the ARS ALTMANN Group. Why to decide for ARS Altmann ? And many other advantages of ARS VS-06 CLIMABOX.